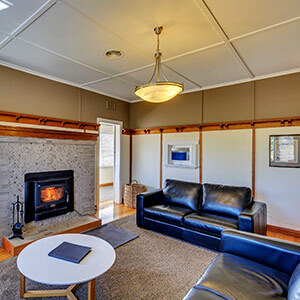 Browse our large range of Central Tasmania accommodation options in Cradle Mountain and the Cradle Valley, the Central Highlands, Tarraleah & Bronte Park and the Derwent Valley. Select your preferred Central Tasmania accommodation and let us customise a self-drive holiday package for you. Set in alpine woodland on the edge of the Cradle Mountain - Lake St.Clair National Park, Cradle Mountain Hotel is the perfect base from which to explore Tasmania’s UNESCO Wilderness World Heritage Area and a comforting rest stop at the end of the day of touring. 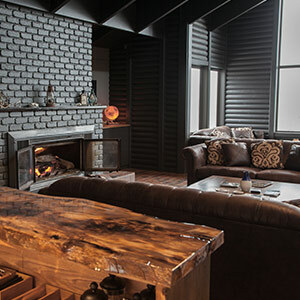 Cradle Mountain Hotel offers guests free access to the Cradle Mountain Wilderness Gallery, all-day dining at the renovated Altitude Restaurant + Lounge Bar, wrap-around balcony with forest views and three room categories, all conveniently under one roof. You don’t have to rough it to truly experience the pristine wilderness of Cradle Mountain. You can immerse yourself in nature from the comfort of your own self-contained chalet with a functional kitchenette, well-appointed bathroom, LCD television and private views of the temperate rainforest. Nine beautiful award-winning self-contained modern farmstay spa cottages. 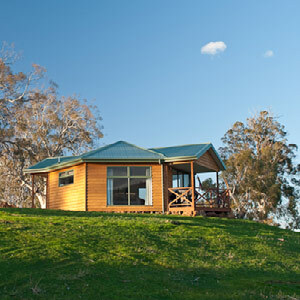 Set in isolation amongst tranquil bush overlooking picturesque Lake Meadowbank at Hamilton, 1 hour from Hobart. Perfect luxurious relaxation for couples or families. Close to Mt Field National Park. Excellent fishing, gas BBQ’s, spacious decks, breakfast provisions, TV/DVD. Farm tours available on request. 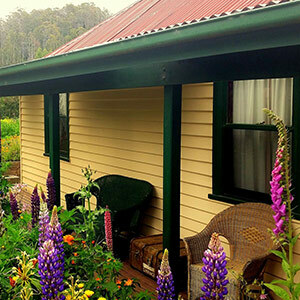 TasVacations Bonus: Stay for 3 nights or more and receive 20% off a farm tour or a complimentary bottle of wine. You need to see it to believe it – Cradle Mountain is one of the most beautiful places of earth. 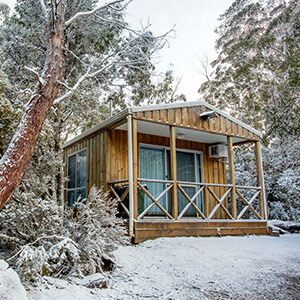 Discovery Parks – Cradle Mountain is set on the edge of world-heritage listed Cradle Mountain - Lake St. Clair National Park, so a true wilderness experience is on the doorstep of your cabin or caravan. Three private suites in an historic farm house, two with kitchens/kitchenette. The suites can be totally private from each other or interconnected to allow up to 10 people. Set in lovely gardens on 36 acres, just a short drive to Mt Field National Park and Russell Falls. Also nearby are the Styx Valley, Strathgordon, the Gordon Dam and the South West Wilderness. 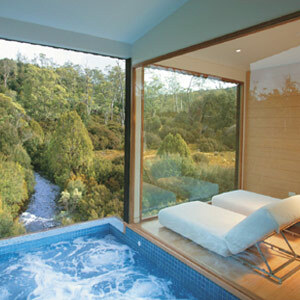 TasVacations Bonus: Complimentary Tasmanian Sparkling wine for Honeymooners. Location! Bronte Park, at the centre of Tasmania, 2 hours from Hobart or Launceston, is the ideal base to explore the Central Highlands. Affordable self-contained Studio Apartments, Spa Cabins and Family Cottages, some with wood fires. Two Electric car charging points. On the Strahan to Hobart travel route, approximately 30 minutes from The Wall and Lake St Clair. TasVacations Bonus: Free DVD hire, WiFi & complimentary port. 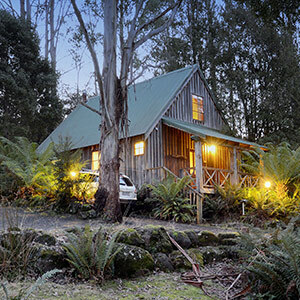 Nestled amongst the tall eucalypts, secluded fern glades and tumbling waterfalls 8kms down Dolcoath Road, Lemonthyme Wilderness Retreat is an ideal base to access the Cradle Mountain World Heritage area. 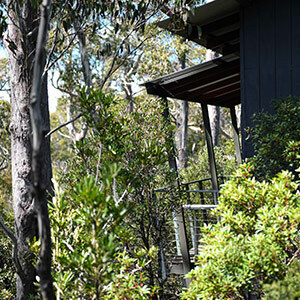 Treetop Cabins, Spa Suites, cosy gas fires await those who wish to be close to nature. 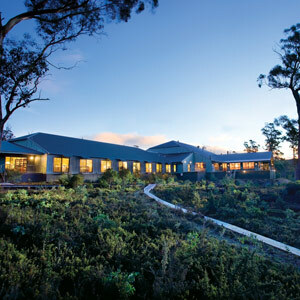 Enjoy Tasmania’s finest food and wine in our Whispering Woods restaurant. Peppers Cradle Mountain Lodge is a unique wilderness experience, set right on the edge of the spectacular World Heritage listed Cradle Mountain - Lake St. Clair National Park, just 2 hours from Launceston and 1.5 hours from Devonport. Enjoy the finest cool climate wines, premium dining featuring fresh local seasonal ingredients, and rejuvenate at the on-site spa. 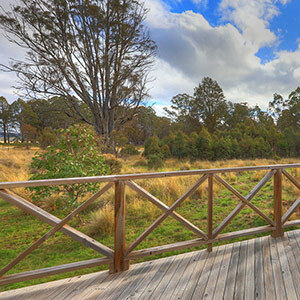 Located between Hobart and Strahan, however more than just a half way stop, Tarraleah Estate offers relaxation, historical interest and warm hospitality in a 1930’s setting. Stay in a self contained cottage, or budget friendly hotel room. Remotely located in the Central Highlands World Heritage Area of Tasmania. A classic lodge environment with just 9 comfortable guest rooms. Walking trails and wildlife at the door. See fish surface from the gin clear waters. This authentically restored building has its own history which is only surpassed by the vastness of the wilderness it sits proudly amongst.